Light element analysis with handheld x-ray fluorescence has been a huge challenge in the past. X-ray fluorescence depends on the ability of the detector to detect the fluorescent energies that are unique to each element (see "XRF for Alloy Grade Identification: How It Works" for more information). In turn, how far a fluorescent energy from each atom can travel depends on the strength of that discreet energy. The lighter the element-or the lower its atomic number-the weaker its fluorescent energies, and the shorter the distance they can travel. The elements that are known as light elements in the context of x-ray fluorescence are magnesium (Mg), aluminum (Al), silicon (Si), phosphorus (P), sulfur (S), and chlorine (Cl). They have such weak fluorescent energies that it is difficult for them to cover the distance between the sample surface and the detector in an air path; they lose their energy within a very short distance. Some common solutions to this problem have been to create a vacuum purge or to use helium to purge the path between the sample surface and the detector.. However, state-of-the-art detector technology has made these "fixes" largely unnecessary for alloy analysis. Contact Bruker, the problem solvers! 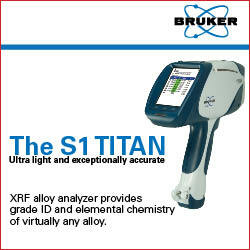 If light element analysis and quantification are important in your alloy grade identification and sorting needs, be sure you choose the best technology available in portable XRF: the innovative SDD (silicon drift detector) found in the Bruker S1 TITAN. The Bruker S1 TITAN not only provides the grade identification of most alloys in seconds along with complete quantitative alloy chemistry, it also provides light element analysis without helium or vacuum purge. The S1 TITAN uses cutting-edge technology not only in its detector, but also in its overall beam and detector technology in the form of SharpBeamTM technology. These beam geometry and detector innovations make the S1 TITAN an industry leader in speed and limits of detection. The S1 TITAN provides near laboratory-quality alloy chemistry in a lightweight package, weighing a total of 3.17 pounds. Contact our knowledgeable staff today to learn more, schedule a free demonstration of the Bruker S1 TITAN at your worksite, or request a price quote.